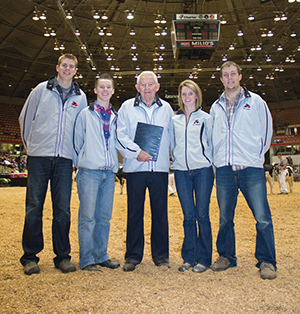 The remarkable Bertram “Bert” Stewart, a friend and mentor to many in dairy circles, passed away on February 12. Even at a very early age, Bert Stewart was a consummate student — he studied those who did well at their trade — be it judging, showing, coaching, farming, or even playing fast-pitch softball. It led to his incredible success. Stewart developed an eye for cattle that has been matched by few in our industry, and it made him a world-renowned dairy judge. His calm demeanor and unique ability with cattle also made him a sought-after leadsman . . . leading an unequalled 16 Grand Champions at the Royal Winter Fair. Ever grateful for valuable lessons others shared with him as a youth, Stewart spent the rest of his life giving back to young people. From 1990 to 2017, he brought champion 4-H teams from Ontario to World Dairy Expo to compete at the National Contest. As a 20-year fast-pitch softball coach, Bert led seven teams to titles in the Ontario championship game. For this and so much more, Stewart was awarded the 2005 Klussendorf trophy, was appointed a lifetime Honorary Governor of the board of directors for the Royal Winter Fair in 2009, and was inducted into the Canadian Agricultural Hall of Fame last year. This legendary man, who impacted so many, passed away on February 12, 2018. In honor of Bertram Stewart, our Hoard’s Dairyman family shares this interview that I had with Bert in the summer of 2011. Our thoughts and prayers go out to the Stewart family and all his friends. In 1951, you were high individual at the Royal Winter Fair’s youth judging contest and earned a scholarship to attend college. How did that opportunity change your life? Back in those days, the agriculture representatives (extension agents) coached most youth judging teams. There were three youth picked for a county team that competed at the Royal Winter Fair. We judged two classes of each livestock species: dairy, beef, sheep, swine, and horses. We had to give reasons on six classes. I was fortunate to win high individual honors at the Royal Winter Fair and received the F. K. Morrow scholarship to attend the diploma course at the University of Guelph. My team also was fortunate to win the team prize. I was very fortunate to have Jim McCullough as my coach. I took almost a month off from high school to prepare for the Royal. Ralph Dunton and my brother, Hilliard, were the other two members of our team. Jim was a good coach and he taught us a great deal about the livestock species. My father helped coach us on the horses because Jim didn’t profess to be a horse person. My dad was a horse judge and did a lot of judging. You are known for your calm demeanor. Did that come naturally? Well, I didn’t even have white clothes at the fair. I had to phone my parents and get them to bring me white pants. To be quite honest, I was so nervous. We had an imported bull from Scotland. I was only 15 years old and went out and showed against all the big-time Ayrshire breeders. The bull went on to be named Junior Champion and then was named Grand. A few years later, I showed for Rosafe Farms. In fact, Rosafe Shamrock Perseus was the first bull I showed for them. He won at the CNE. The more you go into those big classes and show, you become more relaxed, and you do what you have to do to make the animal look good. Getting worked up never ever helped me. You had to live with what happened. If you got badly beat with a good one, you go back to the next show and get her out better. 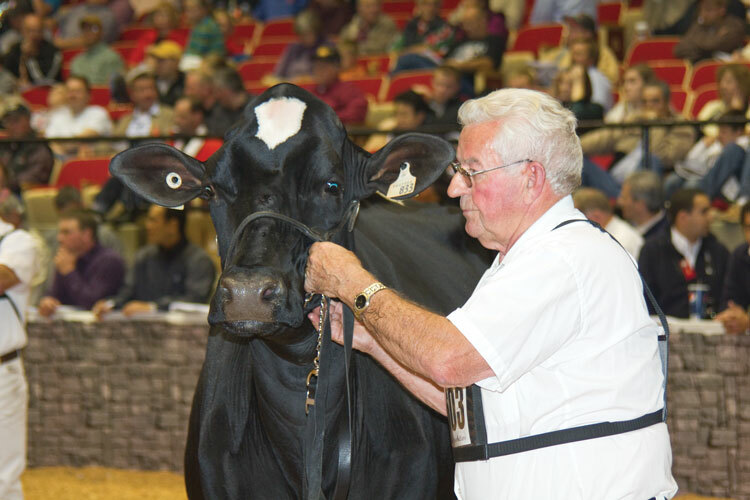 You have led many champions, including 16 Grand Champions at the Royal Winter Fair and most recently the 2010 Junior Champion Holstein at World Dairy Expo. What advice would you give to juniors as they develop their show skills? The 16 Grand Champions probably will never be equaled in this era. Of that 16, seven were Grand Champion bulls . . . five Holsteins and two Jerseys at the Royal. Also, I showed three Jersey cows. The famous Jersey, Duncan Belle, was twice Grand at the Royal (1992 and 1993) and once Reserve. I showed a couple other Jersey cows that were Grand and one Brown Swiss cow. I don’t know what makes me such a good leadsman. I’ve always told 4-H kids you have to relax. If you are uptight, the animal is going to know it. Don’t hold them too tight. You’ve got to let the animal be herself. If you’re relaxed, chances are you will get her to relax. Don’t get me wrong, the bad temperament ones are bad. But sometimes if you take a bad one, take her out and work with her and relax her, you can get a lot of things accomplished. Leading a lot is certainly a big help. I’ve told a lot of juniors that you can’t just take your 4-H project and go out in the ring. You’ve got to do some homework with her at home. You’ve got to know what’s wrong with them and you’ve got to lead and correct the mistakes that they have in conformation. Out of all those champions that you led, who was your favorite? My favorite cow was Sonwill Reflection Bee. I showed her 25 times and won 21 times with her. She wasn’t the best Holstein cow I ever led, but she was the closest thing to a human. I could throw the lead strap over her neck, and she’d follow me through the crowd and go to the ring at the Royal Winter Fair. When she went into the ring, she put her head and her ears up and said, “I’m here to win.” She was a dream to work with. So, I led Duncan Belle at Louisville, the Royal, and everywhere she went. She was a big time cow, and she bred (passed her genetics to her offspring) exceptionally well. Duncan Belle may be the best brood cow that the Jersey breed ever had. For 50-plus years you have given back to youth, not only as a judging coach, but as the person who led the charge to establish what is now called the Canadian 4-H Classic (previously known as the Contact Hayo Classic and then the Scotia Bank 4-H Classic) and the Ontario Dairy Youth Trust Fund. Why? The Scotia Bank 4-H Classic just finished its 31st show (in 2011). It’s now called the Canadian 4-H Classic. The Ontario Dairy Youth Trust Fund came later. I was asked to be finance chairman for Holstein Canada’s annual meeting. I told the group I would do it under one condition: I wanted to know what was going to happen if we made money. Holstein Canada told me to get our committee to come up with a good idea. “If we like it, we’ll back you and fund it,” they told me. I said that we needed a 4-H dairy judging competition in Ontario. They agreed and allowed us to spend money to get that organized. It was originally set up so the coach of the winning county team would go to World Dairy Expo. My teams won the first three years, so I went to Madison the first three years. Then a team from Niagara Falls won the fourth year and their coach wouldn’t go, and I’ve been going ever since with the Ontario teams. Last year (2010), I was going to retire. However, my son-in-law, Jason French, who is manager of the Ontario Holstein Association, thought I should continue. He said he would come along and help drive. So, last year was pretty easy . . . he did the driving, and I did the coaching. I made 20 trips without an accident and I think it’s maybe time somebody else younger should take it over. I don’t know how long they are going to keep me going, but if I don’t have to drive, it’s not such a big job. You started the Ontario 4-H Dairy Judging Competition in 1990 with the goal of having the winning team attend World Dairy Expo. Why did you start bringing teams to Expo? We thought we should make the World Dairy Expo 4-H competition the prize for winning the Ontario competition. I had talked to the 4-H contest organizers at World Dairy Expo, and they said that Ontario could come and participate; however, we wouldn’t be included in the competition as far as winning prizes. That really wasn’t what we were interested in . . . we wanted to give the four contestants a chance to see World Dairy Expo. It’s turned out to be very, very good. The Ontario dairy judging competition is very well-attended by the good 4-H members because the top four earn the World Dairy Expo trip. We’ve had several of the boys from past teams judge both at the Royal and Madison, while others have taken major positions in our industry. One young lady who went to Madison went on to become a lawyer at the largest law firm in Toronto. Why do you give so much of your time to youth? Many people gave me quite a bit of their time. I played a lot of softball when I was young, and my coach actually drove out to the farm and picked me up to play ball. My parents didn’t have time to take me. When I got into 4-H, I had people who helped me with my judging. Then, years later as an adult, when I took on the job of being a 4-H club leader, I just stayed at it. It has been a family activity, as my wife, Hazel, was a club leader for years. She taught homemaking to the girls. I also spent 20 years coaching fast-pitch softball teams and had some good luck . . . I coached boys for 16 years and then I coached a girls team for four years. During those two decades, my boys teams won five Ontario championships and the girls team won two championships. You’ve been a role model and mentor to countless dairy youth. Who was your role model? I was the fifth of six boys in our family. My older brothers were pretty successful. My brother, Andy, was high individual at the 1946 National Collegiate Competition at Waterloo, Iowa. My brother, R. J., who is the second of the six boys, won the 1949 Royal Winter Fair judging competition two years before me. My other brother, Henry, was also on that team with R. J. So, I lived in that kind of environment . . . my dad did a lot of horse judging and my mother judged cooking and sewing competitions. We were blessed to have good ag reps in those days that were livestock oriented. They pushed us to do well. Our family had some pretty nice Ayrshires. I hitchhiked home from college and showed Ayrshires at the little fairs to make some money to get through school. When I graduated, I wasn’t interested in buying, working, or trying to make money from Ayrshires. There were more opportunities in the Holstein business, and that’s where I got involved. Dave Houcks was the first guy who really got me involved in the Holstein business. However, if you were going to pick somebody who I respected a lot, D. S. Dunton and J. M. Fraser were the leaders at the judging schools. There was a guy by the name of Johnny Moles who showed Ayrshire cattle; I used to think I would love to be able to show as well as he did with his Ayrshires. I paid attention to how he did things and learned from there. When you’re working for different people, they all have ideas of what you should be doing when you’re leading their cattle. In the first decade following graduation from college, you spent four years selling feed and fertilizer, then worked for Canada's Holstein Journal handling both advertising and editorial duties, and then spent four years as farm manager at the famed Agro Acres. What did you learn at these early jobs? When I graduated from college, Canada Packers hired me to collect unpaid bills in different areas where feed dealers were in financial trouble. I don't know why, but I had good luck getting money collected from farmers. Based on that success, they gave me a territory in Bruce County, so my wife and I moved to Walkerton, Ontario. The area wasn't blessed with a lot of dairy cattle or support industries. As a result, I became very involved in trying to educate dairy producers on feeding more protein, making hay earlier, along with other improvements. During that job, I got an opportunity to help some breeders prepare and show their cows. I had pretty good luck, but I didn't want to make it a career of it. Then, an opportunity at the Holstein Journal opened up. Naturally, working for the Journal, I got to know just about everybody in the Holstein business. I really liked the job. However, the Journal was located in downtown Toronto, and commuting in and out of work every day (before the Gardiner Expressway was built) was a challenge. Dealing with all those traffic jams wasn't my cup of tea. At the same time, Agro Acres started asking me to come and help them develop a herd of cows, and Angelo Agro convinced me to work for them. That was probably my biggest break because I was lucky that the cows I bought for Agro Acres turned out pretty good. We sold some cows and made some money. Mr. Agro liked the way things were going under my leadership and things went very, very good for a time. However, there was some outside interference. For example, even though I was supposed to be in charge, people would tell Angelo that he shouldn't show under a certain judge and other things of that nature. I said to him, "Angelo, you didn't hire me for that reason. If you are going to make the decisions where we show, I won't be able to work for you." He didn't think I would leave. But I left because the situation didn't improve. Then, about seven months later, things weren't going good for them. Angelo started phoning me, and I eventually went back to do some consulting work. The new arrangement was the best thing that ever happened to me . . . I was probably more involved not being an employee than when I was working 16 to 17 hours a day. Angelo was like a second father to me. I worked with Mr. Agro until the end, and I was very much involved in selling the herd to Dreamstreet Holsteins. I needed to make money. At that point of my life, I got an opportunity to buy commercial cows and sell them to different places in the United States. During that time, I also helped Oak Ridges; I only worked for them when their cows went away from home. George Darrach wanted me to be responsible for the show cattle, and I ended up doing that for 13 years. During that era, the owner, Mr. R.R. Dennis, was hungry to have all the good cows in the country. Between George Darrach and myself, we were allowed to buy every good cow we could find. While I was there, we had five different cows go on to be named Grand Champion at the Royal Winter Fair. We were also named Premier Exhibitor nine times (1964 to 1967 and 1972 to 1976). In addition, we won the Premier Breeder banner twice (1972 and 1974). That was tough to do in those days because Romandale, Pete Heffering, and Oak Ridges were major competitors. All three of those farms had substantial financial resources.